Fortunately we had the hottest day of the year so far yesterday. That is fortunate, because the hottest day of the year so far was in April, and it would have been pathetic to not have had at least one hot day this summer. And what better to do on a hot day than add more heat to your home, at least to the wait station. As in any home construction or renovation you have to think ahead, and things need to be installed in sequence. So today I installed the radiator in the wait station. 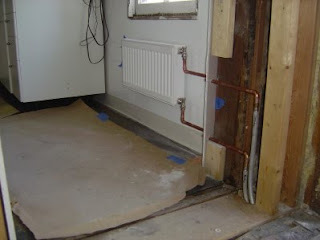 This was largely to get the piping into the wall so that we can close it off, and move on to other exciting adventures. Did I mention that E! was spackling and sanding in the dish station today?! She deserves a medal!! !